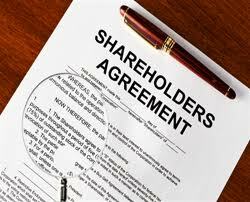 Shareholders agreements are very useful in companies where there is a minority shareholder(s) whose interests and rights can easily be ignored by being outvoted by the other shareholders, particularly in circumstances where the minority shareholder holds less than 25% of the shares. A minority shareholder in this situation does not have the power to block the passing of a special resolution by the other shareholders who can ignore shareholders with less than 25%. To counter this situation many shareholders will enter into a shareholders agreement to protect the rights of minority shareholders and this agreement will typically cover a wide range of topics which we look at below. When a new investment is made in a company the investor would be well advised to have a shareholders agreement drawn up which will govern how the company is to be run at the time of subscription. The sale of shares, if there is a dispute between only two shareholders can be problematic but provision for such a turn of events can be provided for in the shareholders’ agreement. This could be done by a number of different procedures called tag along, drag along, offer round, lock in or a combination of these. These type of arrangements are designed to provide a solution where shareholders have fallen out and cannot come to an agreement as to how to resolve it. The agreement might also cover the operations of the company such as a right for a minority shareholder to appoint a director to the board of the company or to committees of the Board. One of the most important sections of a shareholders agreement is a vetoes section which lists out a series of transactions which cannot be carried out without the consent of the protected minority shareholder. A critical part of any agreement will also deal with a situation where there are two shareholders with each having 50% and no agreement in relation to a substantive course of action. It is common to include a non-compete covenant to prevent shareholders from competing with the company as long as they are shareholders. This would seek to cover competition with the company’s business, solicitation of company’s suppliers and solicitation of company staff. Set out above are some of the most common clauses in a shareholder’s agreement. conflict with the Articles of Association of the company. Next Next post: Do You Make Costly Mistakes in These 13 Areas as an Irish Employer?